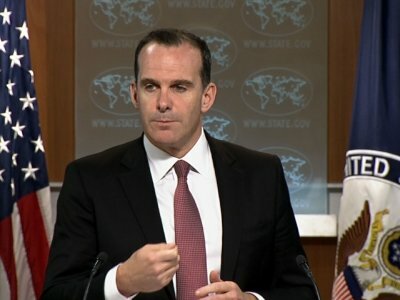 WASHINGTON (AP) — Brett McGurk, the U.S. envoy to the global coalition fighting the Islamic State group, has resigned in protest over President Donald Trump's abrupt decision to withdraw U.S. troops from Syria, joining Defense Secretary Jim Mattis in an administration exodus of experienced national security figures. 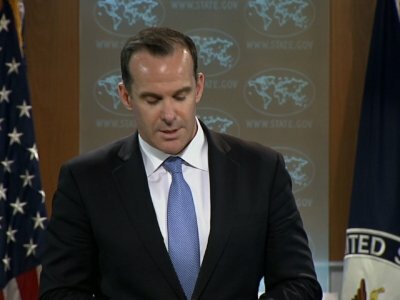 McGurk described Trump's decision as a "shock." A state-linked Saudi news site says a high-level Saudi official is in the Syrian city of Raqqa, which was recently retaken from the Islamic State group, to discuss his country's role in reconstruction efforts. HAMAM AL-ALIL, Iraq (AP) — During a visit south of Mosul on Monday, a senior U.S. official praised territorial gains against the Islamic State group in Iraq, but local officials cautioned more aid is needed to rebuild on the heels of victories against the extremists. BAGHDAD (AP) — The remaining western Mosul neighborhoods held by the Islamic State group are now completely surrounded and IS has lost more than 60 percent of the territory the militants once held in Iraq, according to a senior coalition official.